Teach your child banking basics with this easy-to-follow allowance ledger. Even before she leaned how to write, designer Stephanie Johnson understood the value of a dollar. 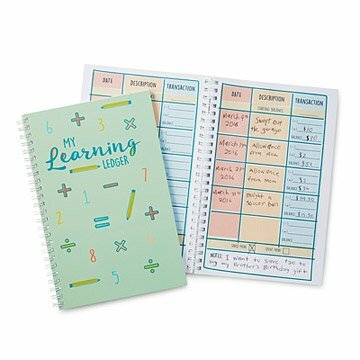 Her parents set her up with a ledger early on to keep track of her $1 a week allowance, a tool that helped her develop accountability and good money habits that she's carried with her ever since. Inspired by her own junior bank book, she developed this kid-friendly financial log as practical (even fun!) way to help your mini magnate allocate their earnings and see how their allowance adds up over time. Made in Battle Creek, Michigan. Six year old grandson immediately filled in the first page, then went to the back pages and solved the puzzles, and entered ways he could make money. Both grandsons, 6 and 10 years old, earn money for household chores, and good grades. The ledger is a great financial management and learning tool! This should be a gift for every child - excellent! There is not enough emphasis on organization and knowing where one's money is coming from and going. This book starts a child in the right direction. It has the basics and is just what is needed. Motivating and very kid friendly! Wonderful book! It is more than what I expected. This is a great tool that I am excited for my son to have as he grows. He gets excited to use this product! I'm excited for him to have this when he is older and see all of his "transactions" at this age! Highly recommended. I gave this to my son as a "just because" gift and he loved it. Great tool for him. Showed it to some friends and they bought some for their kids. Highly recommend! My husband and I thought this would be a great tool for our two children to start teaching them financial responsibility. Not only is the book great for helping them keep track of their earnings, but it is fun for them to use! The second we gave them the books they went out and put it to use. Highly recommend. The Ledger was the perfect tool to introduce my niece and nephew to the "checks and balances" system. They love the incentive and responsibility and are quickly learning good financial practices.